When I first “met” Shashi Bellamkonda on Facebook, he suggested that I check out Twitter. I followed his advice and found this world, a new world. While Facebook is essentially a 1 on 1 medium (judging from its main use), Twitter is often a true group activity exhibiting sometimes a great social energy. I do enjoy this fervor. But quite often, I find some messages that do not make sense to me (“I’m at Stop & Shop shopping for cereal”) or they are completely uninteresting and I wonder why they are posted at all. When I described my disdain to Shashi Bellamkonda and Jill Foster last night, they pointed out that they do not necessarily feel so because on Twitter, you do not always have a full view of the entire conversation that is going on. Unlike in real face-to-face life, at present-day Twitter, you don’t always know all of the participants in an ongoing conversation. You know who is or could "listen" to you and to whom you "listen", but you do not know who else is "listening" to the tweets your peers are sending or to whom they "listen" at present. So, while you might find a particular Tweet not making sense to you, it might make sense to another participant (silent & unknown to you) in this conversation. This silent participant might be interested, for example, in what his/her buddy is really doing now or what type of cereal he/she prefers. It’s like in real face-to-face life, you talk with somebody who has an earphone on one of his/her ears listening and talking simultaneously to others, not just to you. You hear what he/she says, but you don’t fully hear what he/she hears. 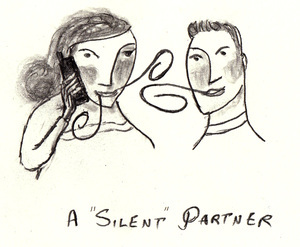 Moreover, to your silent partners, you might be a silent partner yourself. Similar situations might feel unpleasant or even impolite in real life, but at Twitter they are considered to be acceptable. Personally, I find it difficult to accept. Would it be nice if Twitter would provide means to bring these silent partners into full view and "hearing" range for a particular conversation- even temporarily, or at least provide information that your buddy is also getting simultaneous input from silent others. This will make it a more real social forum and only then, I would be able to better perceive if particular tweets really make sense to me or not. Twitter is like the old telephone system with a "party line" you don't really know who may be listening on purpose or by accident. Twitter is basically a broadcast system. Yes, you can narrowcast and permit only some people to read your tweets, but those are the exceptions. 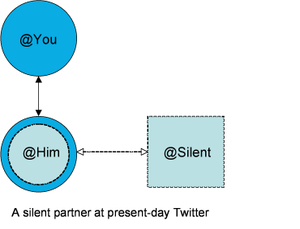 So, the silent partner may or may not be a close friend of the person you are communicating with. It reminds me of early CB radio where you'd share Channel 6 with everyone else, but you and Charlie could have your own conversation in the midst of the other people talking too. So, I think it would be hard to let you know all the people who are reading your tweets. OR did I miss your point? The point is not that other people could read your tweets. It is that others can say things to some of the people you are talking with without you "hearing" it. You "hear" your conversation buddy saying something to them and you don't understand why he/she is saying that. In the real F2F world, it might be considered impolite or even rude... I can tolerate the "rudeness" but I would not like to lose the context of what I'm reading. This doesn't bother me Nahum. I don't feel the need to hear the things other folks are saying to people I'm talking too, at least in the context of Twitter. But I respect the fact that it bothers you to not get that additional context. in the "let's talk among ourselves in front of hundreds of people" kind of way. Jonny, I respect the different perceptions and I'm trying to understand them. The context thing bothers me sometimes because without it some tweets look nonsensical to me while they might be actually sensical. More on this in one of my next posts. I like the panel metaphor you propose in describing the freedom to participate. This is one of the strongest points of social media and we should take advantage of it. In his new book, "Here Comes Everybody: The Power of Organizing Without Organizations", your old professor, Clay Shirky, eloquently describes the organizational advantages of this freedom that social media provides. The difference of social media from a panel is (again) the ability to hear all conversations occurring in the room. This might be important especially if a topic is discussed in logical depth. Twitter brought me to this post, because I follow Jonny, who I found on Blipcast.tv originally. I wish I understood what it means that we are connecting to people via all these social networks, but I don't. I just know that there are people out there saying "hello" or sometimes "Time to get dinner ready" and I'm ready to "hi" back or "check out this link". Ultimately, are these meaningful connections? I'm not sure. I am also fascinated by Twitter as a storytelling tool. I have been experimenting with using social networking sites for storytelling and I'm dying to try to play out a scene on Twitter. I hope to do it in the next few days. Thanks for bringing up the "connection" point. I am also "baffled" by the use of the word connection in social media. I think it can have many meanings or gradations. Yes, some are using it for saying "hello" and some are using it for a much deeper interaction. It might be meaningful to the sender and some receivers but to some it might not look the same way. More in one of my future blogs. How would you see Twitter as a storytelling tool? Maybe we need to talk about it off line- schmooz@mac.com.